A house build with stone, takes us back into history where stone building usually gives the idea of power, to places like castles and forts. It reminds us of a time long gone, while creating a sense of wonder about how those people were able to build places like that without the use of modern technology. CCD Architects created La Croisee by combining two stone structures with a plastered building as well as 'n glass structure. The house brings back that sense of wonder from long ago, with modern elements—combining two personalities in one. Set in a T-shape, this house immediately attracts one's attention. The far side is made out of stone, while the inner parts is created with a glass and metal construction as well as the normal brick/plaster combination. Small windows is set at various places in the stonewall, and only two small windows high up against the white wall allows light into the interior. The stonewall on the other section has one window on the side, which might even be a balcony. A splash of colour is inserted against the brown of the stone and the white paint job. 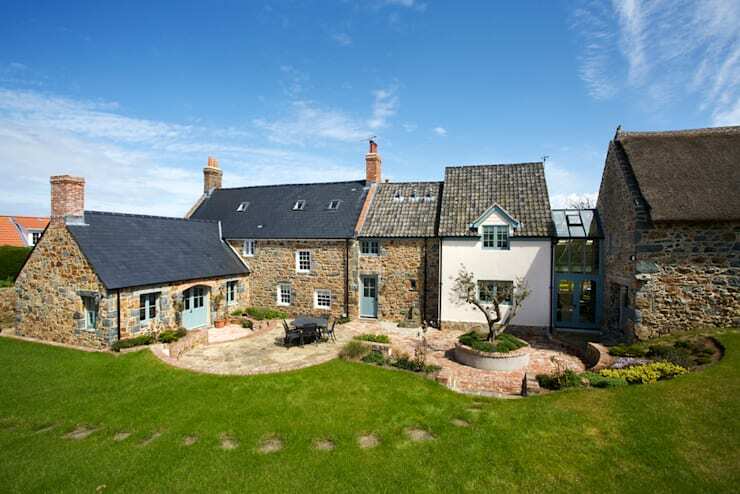 The soft blue-green paint and all around windows makes the stone cold exterior looks warmer, more welcoming and softer. The large amount of sunlight beaming into this room, makes it the perfect spot to curl up underneath a blanket on a cold winters day with a hot chocolate and your favourite book. If there is ever a fire in this house, there is an abundance of doors through which the residents can escape. Lovely double doors, a single door with glass panes and glass doors opens up unto the courtyard. The doors are in the same blue-green colour as the glass and metal structure on the other side of the house—creating unity. The stone is interrupted by the piece of white and glass doors, before it goes on on the right hand side. The courtyard is not your normal square, but then again nothing about the exterior of this place is like a normal building. It is two circles, close together, while the right hand circle has a tree and grass island, but the left hand circle has a table set and flowers next to the wall. 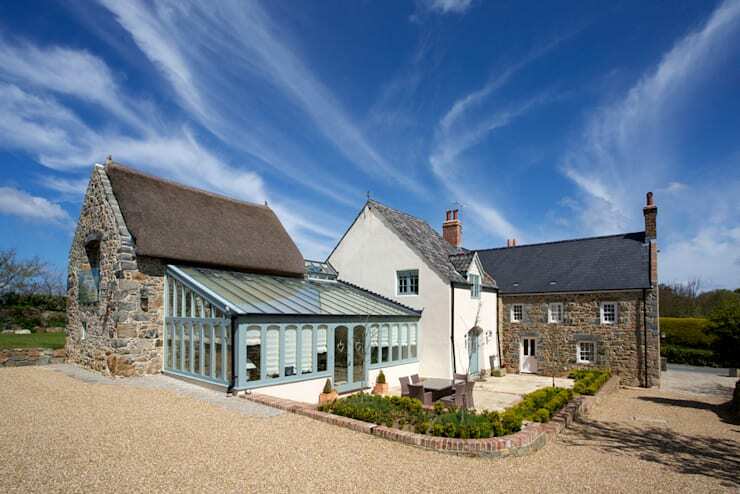 The left hand side sections of the house's roof is made from tiles, with a few skylights and chimneys, while the other section only has a grass roof. This exterior does not prepare you at all for what is waiting on the inside. Who says small and cosy is the only way to go? This living room might be big and feel as of it can't be cozy, but the wooden floors, the wooden beams and the lights that give of a yellow colour makes it look welcoming. It is the perfect place to have a group of friends over and during the winter months a great place to keep warm with the fire place in the room. Most of the furniture is pushed to the right hand wall, creating a walk way next to the windows. The furniture consist of couches as well as chairs, to give a bit of dimension, while standing lamps illuminates the room closer to the floor. The pictures and carpets makes the room inviting, while the tray with drinks in the foreground reminds us of butlers serving us. There is not a lot to hallways and this one is no different. The wall on the left hand side is a bit sloped, it has wooden floors and is quite wide. It is in the same off-white colour as the living room and the windows on the left side let some light in, bathing the hallway in a yellow colour. One big advantage of this hallway is, is the cupboards lining the walls, from floor to ceiling. One can never have too much storage space. 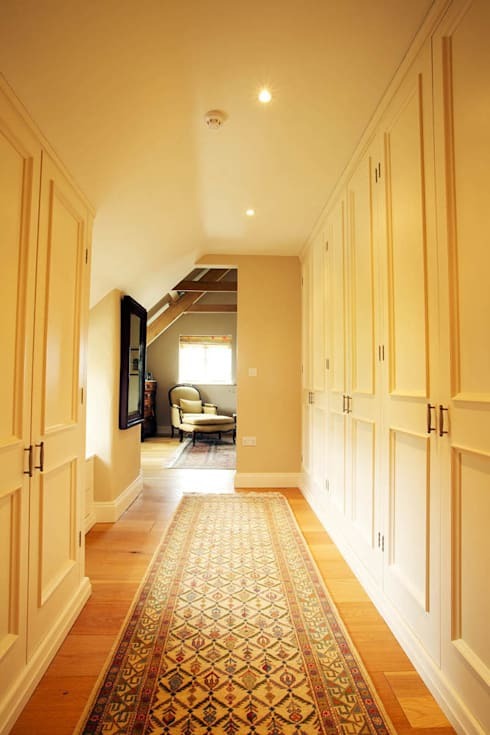 The runner brings the hallway into proportion, because of the wideness and niches on the left, while the mirror brings in a bit of aesthetic and contrast to the monotonous colour, before walking into the bedroom at the far end. 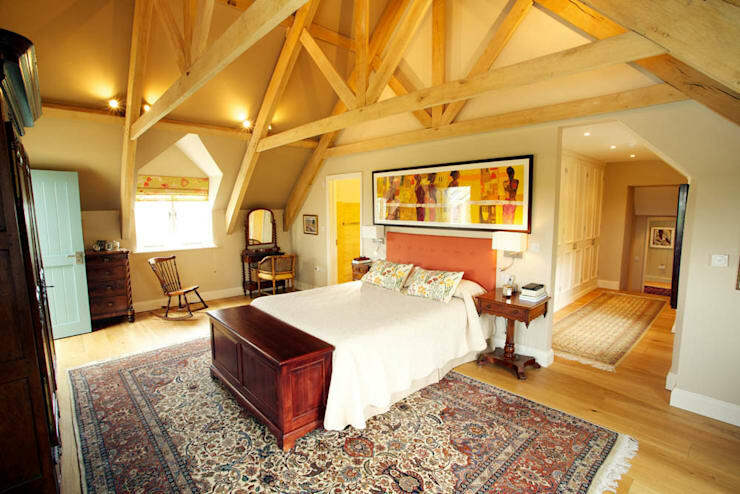 The first thing we see when looking at this bedroom is the A-frame, a feature also evident in the living room. 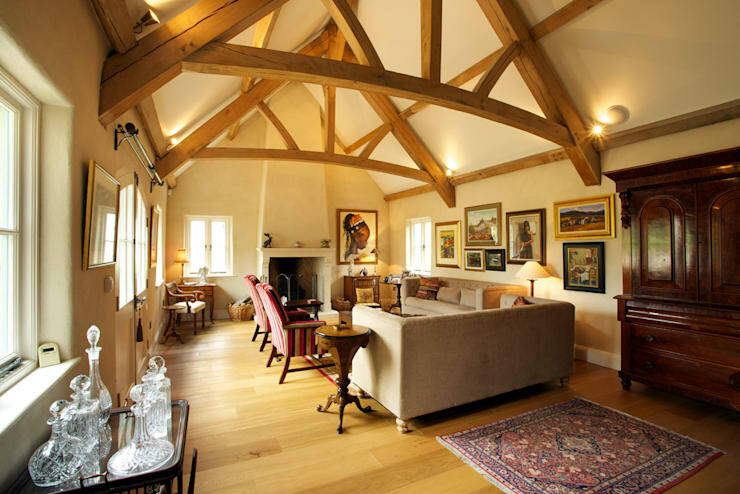 The wooden beams is also exposed in this room, with only a few windows letting in some sunlight. A few lights on the beams cast a yellow light over the room, which is reinforced by the wooden floor. The double bed looks small in comparison to the open spaces in the room, while a red wooden chest is at the foot and end of the bed, that is in stark contrast against the white bedding. The big carpet that is underneath the bed, makes the room look fuller without loosing any floor space. A rocking chair stands next to the window, a matching vanity table and bedside tables and art rounds off the room perfectly. 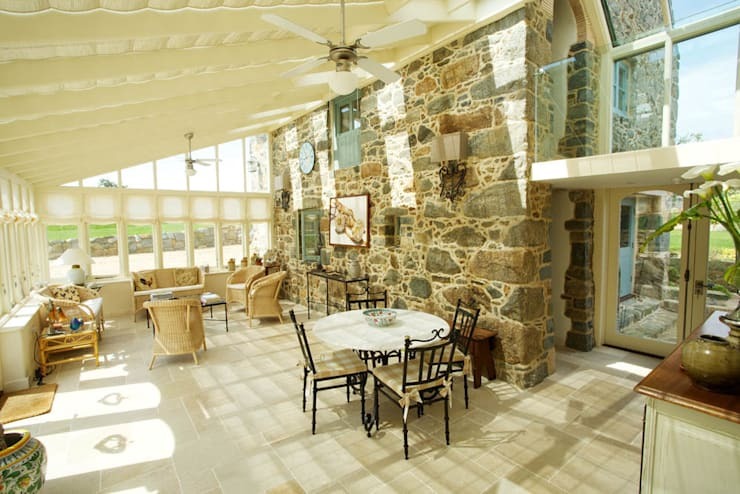 This room is illuminated by two sides of windows and the stone wall creates some texture in the bright room. The stone wall also brings in some nature and by using some plants on the outskirts of the room. A small four seat table provides a place where a family can sit down for breakfast and a couch-set is next to the windows—a great place for some afternoon tea. To make the room more interesting, the windows from the original building is used, thus creating different frames on the wall. From this room you can access the outside on either side through some double glass doors. A walkway with a glass balustrade gives access to the top room. Walls with floor to ceiling shelves is a dream to any book lover. A few décor items is put on different shelves, but mostly it is stacked with different books. 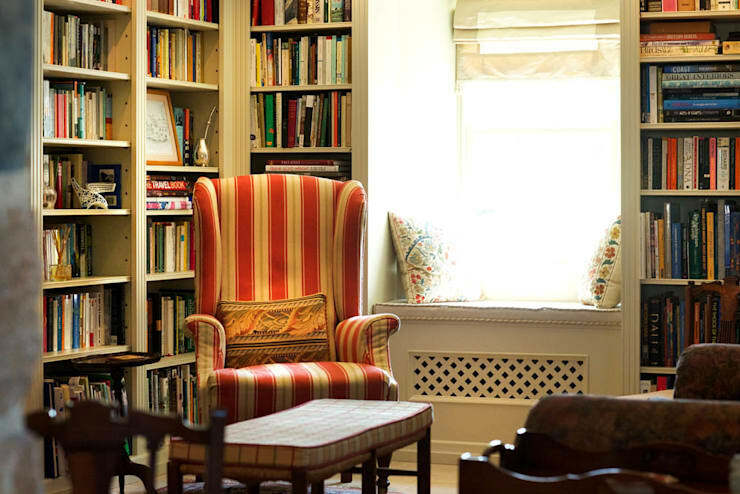 Comfy chairs, an ottoman and a bay window provides sufficient reading space, while still enjoying the sun's rays. The room is painted in an off-white, reflecting the rays and creating a calm presence in this mini library. For more mini libraries check out these six ideas. 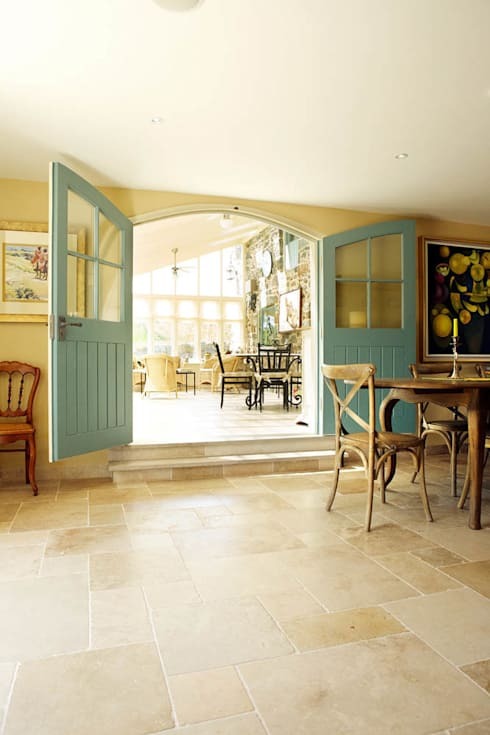 Beautiful blue-green double doors leads out of the sun room into another room with some more tables—in this case probably a dining table. The floor is also lower than the next room , further differentiating the two from each other, while the art brings in some beauty between the off-white walls, brown furniture and light brown floors. This stone building is the perfect place for somebody who love to entertain, because of the open spaces and the big exterior. Would you like to live in a place like this? Tell us why in the comments below!